My rock perch for a break on this afternoon’s ride in the San Marcos area. Some shots of the after-work ride on Thursday up in the Laguna Mountains with Steve. The toes are still a bit of distraction but things are better than last week. The weather was pretty freaking awesome with low-mid 70’s and a nice breeze. 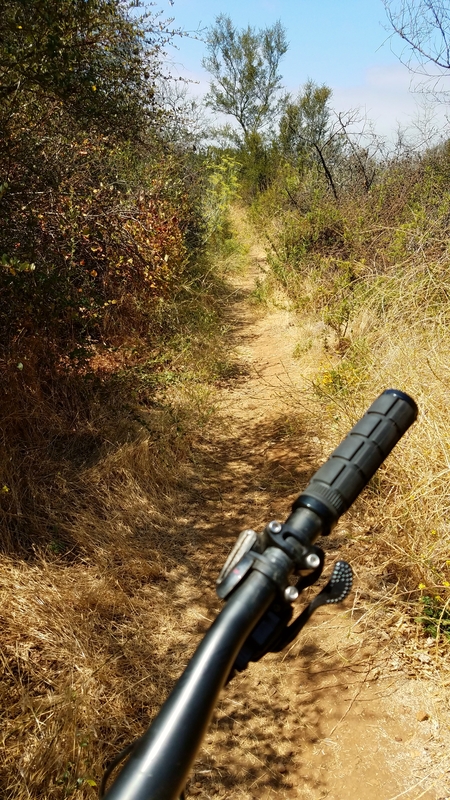 Author MTBBillPosted on August 26, 2017 September 29, 2018 Categories General MTB, San Diego, TrailsTags Big Laguna Trail, Laguna Mountains, woundedLeave a comment on More Laguna! The toe bone is connected to your leg bone. Your legbone is connected to your hip bone… After gimping around for a week and being mighty gentle with my stride for a couple more weeks on a work trip, I got on the bike this morning. It was good to be back on a trail but man could I tell I have been slacking. My left toes were doing okay until I got into sections that required some mashing on the pedals. In the techincal bits I was surprised how just about any body english move made me unpleasantly aware that my toes play a role in executing that. I think I will need to be a bit more selective about where I ride for the next couple of weeks. But yeah its good to be riding!